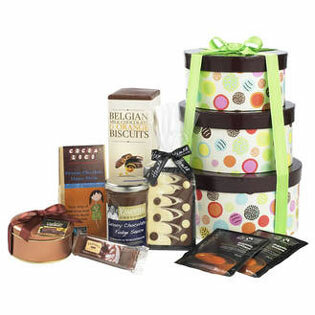 Presented in three tiered gift boxes, beautifully tied with a ribbon, your recipient is certain to be impressed even before they've managed to get to the chocolatey contents of this gift. As people who appreciate the simple pleasure that is chocolate, we've committed ourselves to finding the very best for inclusion in the Tower of Chocolates. From the aesthetically pleasing Hames Artisan Double Chocolate Bar through to the simple but scrumptious Farrah's of Harrogate Chocolate Covered Fudge, every item in this gift would satisfy even the most discerning chocolate palate.